I present You my second attempt in java (and in programming in general). It was necessary in my learning curve to my initial purpose: to make a useful plugin. I hope it will be ready before the end of the world. Until than, this plugin could be find also on Source Forge here . 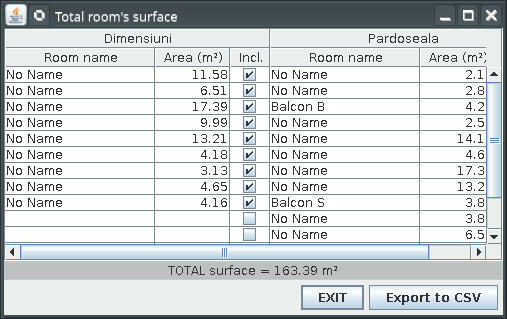 The plug-in could be find here:Rooms Surfaces plugin . Hope somebody can use it. New version (1.1) with few improvements. 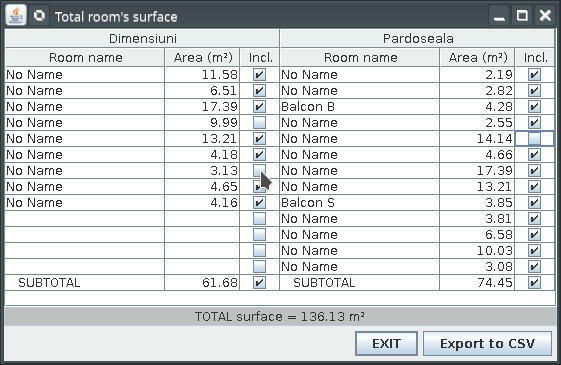 Now, by check/uncheck the SUBTOTAL, check/uncheck all rooms at that level. Checking a room on unchecked level will also check the level. The plug-in are under menu Tools->Total room's surface. I recommend to remove (uninstall) other plug-ins with the same functionality. or from Source Forge here. Very nice plugin! Saves me the creation of Excel-Sheets like i've done so far! Thanks man!!! Would be great if we can sort the rooms for example living area and technical area. Downloaded and installed but nothing opens (after choosen the option in tools menu) ?? ?